Drop by for a drink In ‘t Aepjen, the only wooden house in Amsterdam. In ‘t Aepjen is one of the remaining seventeenth century medieval tasting houses. This pub is a perfect place to warm-up on a cold day. You will find here more jenevers (Dutch gin) than you knew by name. Sample cheese, salami and liver sausage when you are feeling hungry or apple pie with frothy cappuccino if you are not in the drinking mood. In seventeenth-century Amsterdam there were no cafes or bars. Customers who wanted a tipple went to a ‘proeflokaal’, a tasting house. 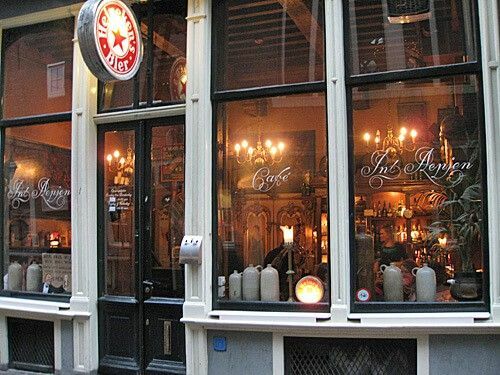 Here they would sample jenever (Dutch gin), or brandy before buying their favourite drink. These traditional tasting houses have now been converted into bars that still serve drinks but, unfortunately, no free samples are given anymore; all drinks have to be paid for. In ‘t Aepjen translates into English as ‘At the Monkey’. This pub dating back to the sixteenth century has many original feature. It is one of the two remaining wooden houses in Amsterdam (the other one is at Begijnhof). In ‘t Aepje started as a seamen hostel. Sailors who got into trouble because they had lost all their money gambling, were allowed to pay in kind; with monkeys. On board ship they often had monkeys from far away countries such as Ceylon and the East Indies. Today monkeys are no longer legal tender. The sailors have long since gone, today in ‘t Aepjen clientele varies according to what part of the day it is – from young professionals to retirees and from travelers to regulars – always easy-going, the pub is always crowded. Whatever you order be sure to sip jenever from tulip-shaped glasses filled to the brim.